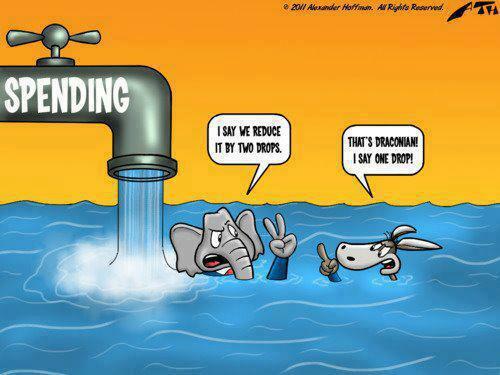 The “increased spending” under Obama is the result of policies in place regardless of who the President is. Discretionary spending has actually risen the slowest under Obama, relative to previous US presidents. While there is a general agreement that spending must be curtailed in certain areas, Democrats would like to see the Bush tax cuts on the top earners rolled back while Republicans disagree and see spending cuts (spending cuts that are far more significant than what Democrats offer) as the only option for paying down the deficit. While it’s true that spending has increased over the last few years, data from the non-partisan Congressional Budget Office clearly shows that reduced revenues (from the Bush tax cuts and the lowered revenues that accompanied the economic recession Obama inherited) have done more to widen the gap between federal revenues and spending, leaving the government to borrow more and more, which has widened the deficit gap and increased our debt. 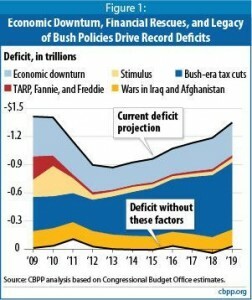 Something else worth mentioning is the 2009 deficit, which Obama has been unfairly blamed by his critics for. As Dan Mitchell of the CATO Institute (and active opponent of government spending, regardless of political party) points out in his article, Who’s To Blame for the Massive Deficit?, the 2009 fiscal year began in October of 2008. 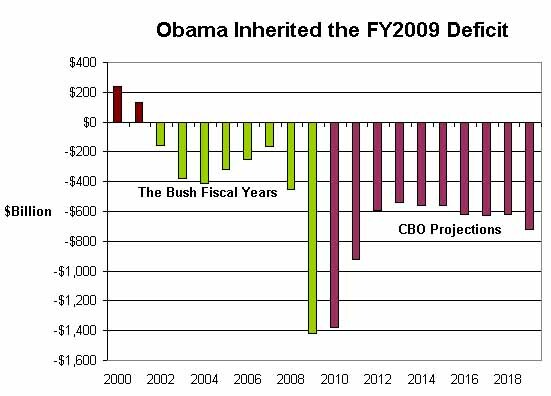 So the policies that affected spending throughout 2009 were mostly established well before Obama was inaugurated in early 2009. It’s also important to point out that automatic stabilizers (like unemployment insurance) kick in when the economy takes a downturn (this should be taken into account before overly criticizing George W Bush for the deficit spike). While it’s commonplace to hear small government-advocates blame politicians for stepping into office and increasing spending, much of this ‘increased’ spending is due to the rising costs of pre-existing programs. The largest of these by far are Medicare/Medicaid and Social Security. As health care costs in general rise, Medicare/Medicaid costs rise with it (the difference being that these programs keep absorbing the costs whereas private health insurance companies simply raise premiums, deductibles or refuse coverage altogether). In fact, contrary to many critics who seem to believe that government spending is subsidizing welfare queens or going to foreign aid development, both welfare and foreign aid are very small portion of the budget. 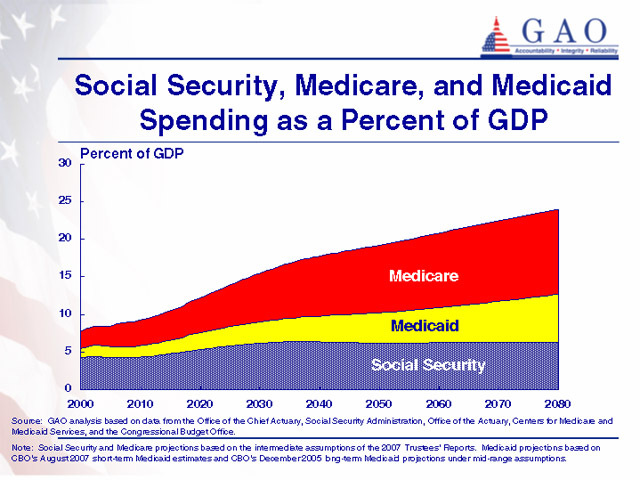 Medicare/Medicaid and Social Security are nearly half the budget. 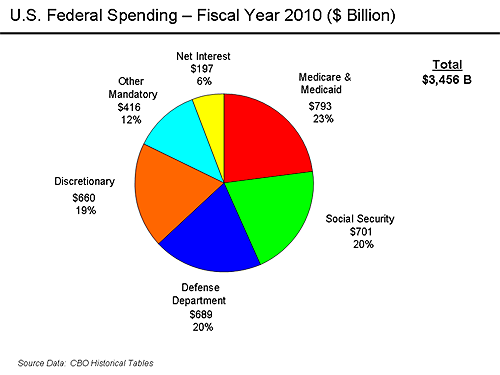 Add defense spending and that’s more than 60% of the federal budget. Critics who blame Obama’s health care plan for the increased spending seem to believe that not implementing the plan would be free, and compare the costs of the plan to zero. But in fact, Obama’s health care plan was implemented largely to to curtail spending and bend the cost-curve downward. So while the plan does include upfront costs, it also cuts spending elsewhere (and ideally would use revenue from the intended rolling back of the Bush tax cuts to help fund the plan). The CBO analysis is clear on this issue: Obama’s health care plan would reduce the deficit. According to CBO and JCT’s assessment, enacting the Patient Protection and Affordable Care Act with the manager’s amendment would result in a net reduction in federal budget deficits of $132 billion over the 2010–2019 period (see Table 1). In the subsequent decade, the collective effect of its provisions would probably be continued reductions infederal budget deficits if all of the provisions continued to be fully implemented. See the full analysis here (warning: semi-large PDF). While the GOP and others on the right are busy blaming ‘spending’ on the recent downgrade from Standard & Poors, their own assessment makes it clear that a lack of agreement on raising revenue is partly to blame. A Fox Business article, The Last Countries With Triple-A Ratings (and Those at Risk of Losing Them) lists the countries still boasting AAA ratings. Almost everyone one of the countries with AAA ratings has a larger government than the United States (making it difficult to argue that size and scope of government is the reason for the downgrade). It goes without saying that ‘raising taxes’ can easily be made to sounds ‘socialist’ and is not nearly as appealing to many as trashing Obama and other politicians for “runaway government spending.” However, it’s clear that the debt and deficit are more of a result of lowered revenues than increased spending. And legislation is often criticized without understanding how it will lowered costs. 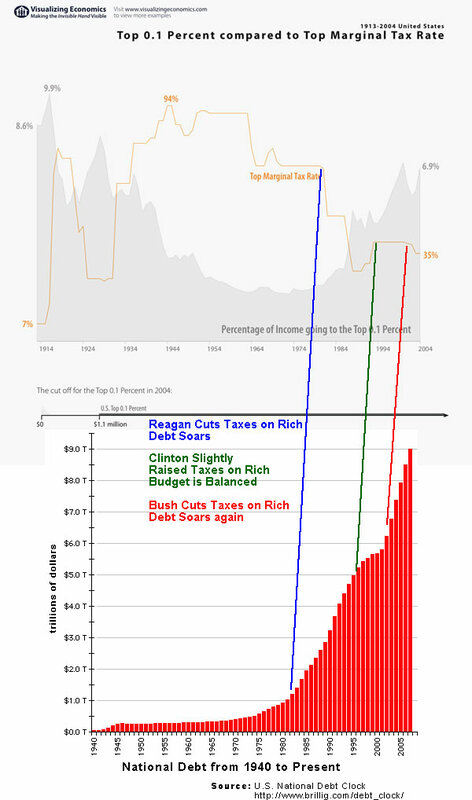 It’s interesting to note the correlation between taxes on the rich, the concentration of wealth on the rich, as well as the rising debt.